At last! The Sewing Lawyer has again sewn something. A pair of very nice pleated pants, if I do say so myself. 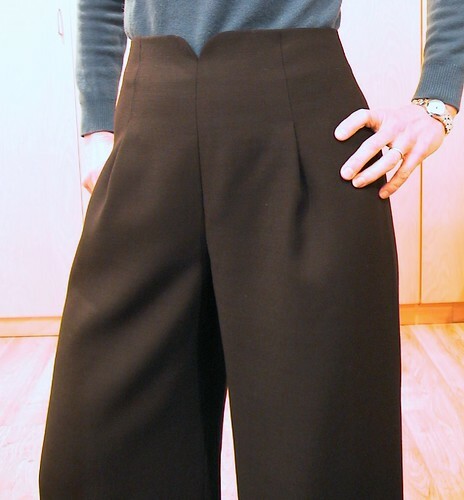 Burda would undoubtedly call these "Marlene Dietrich trousers", but they're not made from a Burda pattern. These are made from Simplicity 4044, a 1940s retro re-release that I have had in stash for quite a few years, but it's still on the Simplicity website. Go and buy it now if you want a simple, high waisted, flowy pair of pants. I highly recommend this pattern! There are only four pieces - front, back and facings. However, my recent infatuation with knitting got in the way of finishing these. I improved the hang of the pants, which are constructed in a very soft but drapy pure wool fabric, by underlining with Bemberg. This gives all the advantages of lining, but reduces any chance that pressing would reveal seam allowances, facing edges, etc. The front pleats and little dip at CF are the subtle details that make these really nice, IMO. I cut the legs slightly longer than the pattern calls for and made a deeper hem, which also increases the overall weight and therefore the nice drape of these pants. I also moved the zipper to CB since I hate sewing zippers into a curved seam and would prefer to leave the side seams accessible for fine tuning the fit as needed. These needed very little. I predict these will be a great addition to my wardrobe, and that I'll make this pattern again. In other news, I have most of a sock knitted. Humor me. It's my first. My husband found this interesting jacket recently. It purports to be a curling jacket. It is made by a Dutch company called Scotch & Soda - Amsterdam Couture. I think it's slightly ironic to actually wear it curling, which is how it's used around here. I wouldn't blog about it at all except for the care labels. In a comment, okie2thfairy asked if I could show in more detail what I was talking about when I mentioned "improving" the pattern for my Teal Jakku with triangle insets at the shoulder. To remind you, here is the completed front shoulder. Below is a picture of the pieces, before assembly, that were made according to the pattern. The textured piece is knitted as a long curving rectangle (made with short rows so that the outer edge is longer than the inner edge). After the piece is seamed, it forms a donut-shaped piece. The short edge is then sewn to the lower edge of the upper back piece (so it forms the lower back), to the armscye of the sleeves, and then up towards the back neck edge where it forms the collar. The pattern, as written, instructed you to attach the piece along the front edge of the sleeve cap to the shoulder point, and then along the entire top edge of the upper back piece, which is a straight line that runs from shoulder point to shoulder point. If I had followed those instructions, the collar piece would have had to detour into a corner which would pull it out of shape. In the picture to the right I show the corner and the direction in which the edge of the collar piece would have to be forced to fit. In this photo of the front of this jacket on the Finnish pattern site, you can (I think) see the distorting effect on the upper front and collar. The shawl collar is forced open sideways and the fronts have a harder time meeting in the centre. I suspect that the jacket would be less comfortable to wear as that piece would be fighting to return to its knitted-in shape. So I made two little triangular pieces to fill in the shoulder corner, and avoid distorting the collar. 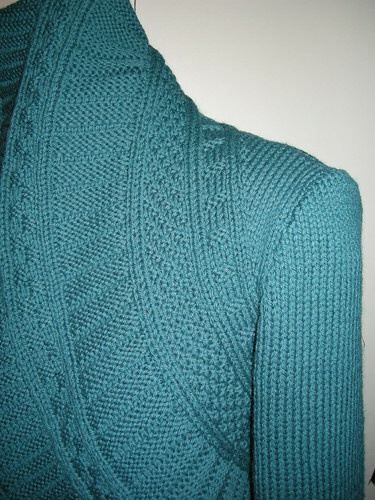 The result is that the collar hugs my neck, is very cozy, and the whole sweater feels wonderfully comfortable. While the Teal Jakku pieces were blocking I seem to have knit a hat out of my leftover wool. Please excuse my slightly stunned expression. I think it's caused by the unexpectedly speedy pace of my production. Here's another shot that shows the shape of the brim better. There are 5 cables that join in the centre of the crown. It goes pretty well with the resurrected Burda 7731 coat. It has no closure. I've got this big silver pin that seems OK with it. Thanks to the clearly explained knitting videos on KnittingHelp.com (also available as a $5 app for iPad - excellent value), the assembly of this project involved my first ever attempt at the Kitchener stitch, which is supposed to be completely invisible but in this case is merely not glaringly obvious. It was moderately difficult because I was seaming the deeply textured lower edge/collar, so there is a bit of disruption in the pattern. If you must know, it's mostly located under my left arm, but because of the angle of the pattern it isn't completely hidden by my arm. This location was suggested on Ravelry but in retrospect, I think the seam would have been less jarring if I'd placed it at the CB. KnittingHelp also supplied a great explanation of the mattress stitch which I used to sew all the other pieces together pretty much invisibly. 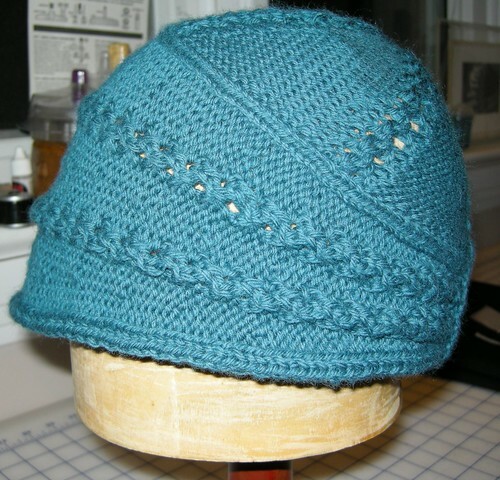 For those of you who think I've gone over to the dark side and are wondering when The Sewing Lawyer is going to resume producing more interesting projects, here are a few sewing-related thoughts on knitting design and construction. According to some things I've read on the internet, some knitters will go to great lengths to avoid having to actually sew their knitted garments together. They'll knit a piece entirely in the round from the bottom up or the top down, splitting off at the shoulders to form separate in-the-round tubes for the sleeves, including increases and decreases to build in shaping (where you'd sew darts), and cleverly finding ways to include hems, pockets, buttonholes, collars and all manner of details which are joined by picking up stitches and knitting new details directly onto a completed piece. 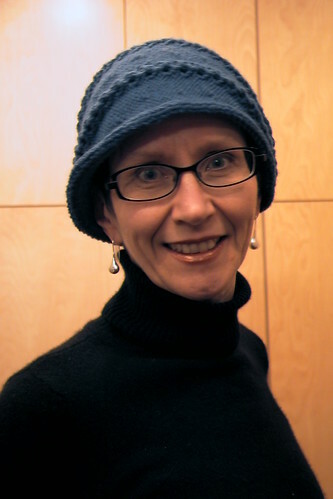 For example, the cloche hat brim is seamed at its narrowest point, but the crown is then knitted round and round, decreasing from 100 stitches picked up from one edge of the assembled brim. It's a new world. Sewing a knitted thing together with the same wool it's made from, and carefully picking up a row or stitch at a time at each edge of a seam means that even if the thing isn't knitted together, it looks like it was. The perfectionist in me really likes this fact. As Sherry pointed out in a comment to my last post, the fact that knitted pieces stretch means they can be forced to go together, but this isn't necessarily a good thing. Understanding how flat shapes best fit the 3 dimensional human body without distortion (i.e. how sewing patterns work) seems immensely useful to me in knitting. My decision that I should insert a little triangle at the front shoulder area, instead of forcing a smoothly curved piece to fill in a right angle corner was definitely the right one. I have a pair of badly needed black pants cut out; they'll look smashing with the jakku. Here's a sneak peek. I've just pinned the pieces together. Teal jakku - almost done! You can immediately spot the problem. The donut-shaped piece which forms the lower back and wraps and curves around to the front to become a luscious shawl collar doesn't fill in the upper front shoulder area. According to the pattern, it is supposed to be sewn under the arm, along the front edge of the sleeve cap to the shoulder point, where it must make a right angle turn and then flow along the dead straight upper edge of the knitted back. Sure. My sewing experience suggests to me that even though it is probable that the gently curved edge of this piece can be made to stretch to fill in this corner, it won't sit there nicely and I'd be tugging at it constantly and wondering why the jacket doesn't feel right. This piece wants to flow up at an angle from the under arm area, angling towards the neck. As shown to the right. Which leaves a little triangular opening, as you can see to the left. I am going to knit a little piece to fill it in. Then I'm going to block the pieces and sew them together. 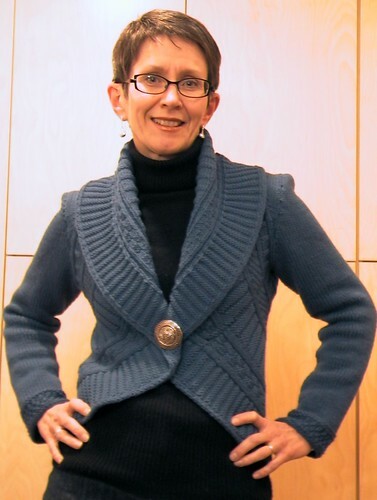 And then, I'm going to make a dress and a pair of black pants that will go with this lovely sweater jacket. This week I've read quite a few inspiring and (let's face it) intimidating wrap-ups of the year that just ended, sewing-wise. I certainly can't compete with folks who report having made multiple garments per month. I feel 2011 was the year of disjointed sewing. Let's see if my impression is accurate. Looking back on my posts for the year, I see that I managed to make quite a few things. However, the total output was hardly an effective assault on The Sewing Lawyer's stash, or a coordinated production effort for her closet. The year started well. In January, month of new year's resolutions, my thoughts turned to physical activity. 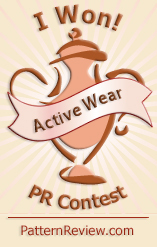 I produced some exercise gear and my prize-winning bike jacket. I wear all these garments a lot. March saw me complete my leather jacket. Which had been languishing unfinished since November of 2010. This is another garment I wear constantly. April was an interesting sewing month. 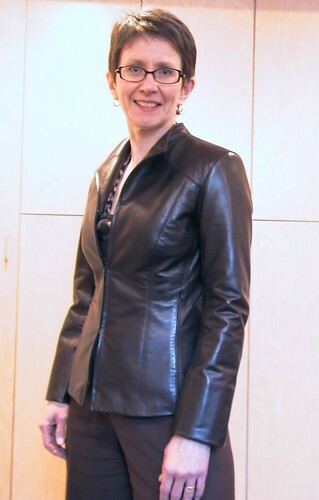 I made a wool sheath dress to coordinate with my leather jacket, and I had a fantastic time in Chicago with sewing friends Patti, Liana, Ann, Nancy, and the members of the Haute Couture Club of Chicago. In May, I reported in on a pair of lined wool pants. Not only were they too warm once done, they're now too big. I'm not complaining about having taken off a few pounds, mind you, just haven't steeled myself to unpicking that hand-sewn waistband... More sensibly, I also made a couple of knit dresses. Summertime. 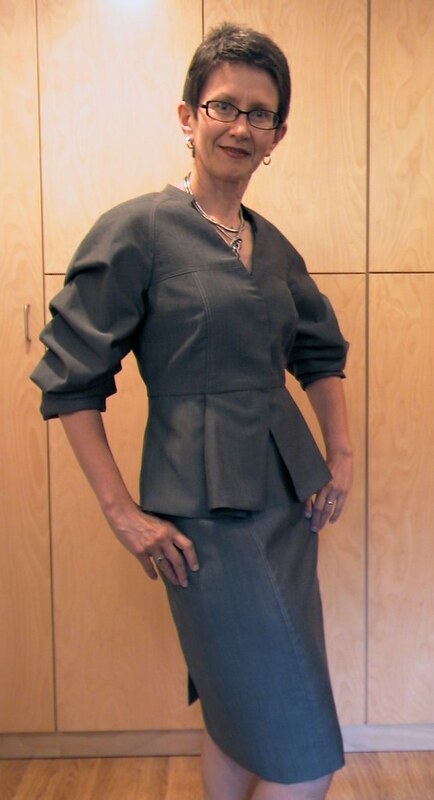 A simple little sleeveless blouse took me far too long, after which my version of Vogue's knock-off of the Akris suit became a long term project that got sidelined while I got over being infatuated with Vogue 1250. Phew! All this is really good stuff. But then ... the sewing wheels fell off. More off-season sewing. I made a sleeveless summer dress and another knit dress that just didn't work in the fall. Hopefully they'll come into their own next year. Then came a pair of PJs, a couple of bras that are tantalizingly close to being really good, some storage units for my sewing room, and a batch of undies. All perfectly OK, but nothing that made me feel I'd made anything really special. My sewing momentum revived faintly in November with more sports clothes: my curling pants and pink Jalie top. However December was a sewing bust. Is it a coincidence that I picked up knitting in late fall? Since early November I've made 3 hats, a scarf and most of a sweater. So, looking ahead, what do I want to accomplish for 2012? That seems like a long enough list. No doubt I'll get distracted.